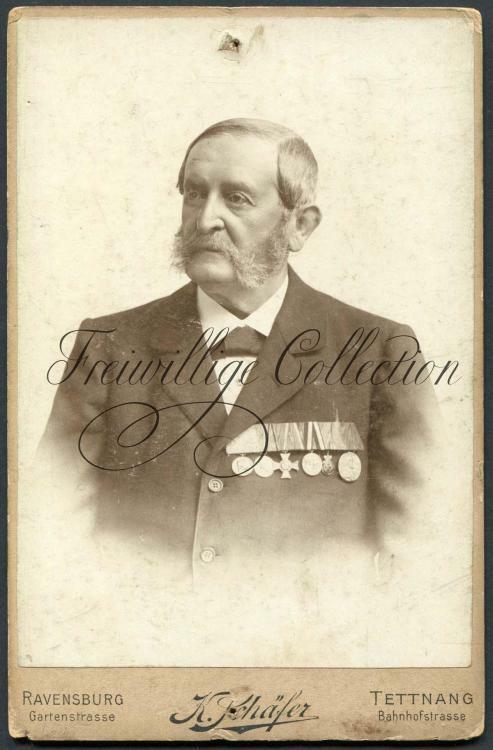 Dear gentlemen, here's my latest purchase - CDV showing unknown Wurttemberg veteran from Ravensburg/Tettnang. 4. Prussia. Kriegsdenkmünze für die Feldzüge 1870/71 für Kämpfer. 5. Russia. Imperial Order of Saint Anna, 4th class (so-called “klyukva”). 1. Have I idenitifed decorations correctly? 2. Is there any chance to get the exact name of the veteran? seems like an EX-NCO i don`t think that we can ID that guy without a name. Served in 70/71 as a combatant may be later a lower officials rank or Hofcharge. The pic was taken in 1897 or later - definitely bevor 1914/15 - because of the russian. if it is the Annenmedaille , Bretzendorfer has listed 8 recipients. No. 2 could also be the Zivilverdienstmedaille OEK 2996 - 2998. Dear Andreas, do you have complete list of those eight Germans awardes with the Russian St.Anna Order, 4th grade? All NCO - so one of it could be your guy. - i would bet it is one of the former members of the Schlossgardekompagnie. Is it know what heroic deeds those NCOs were awarded Russian order for? As for your guess, i.e. Schlossgardecompagnie, could you please share with me why do you think so? could you please share with me why do you think so? No, the Schlossgardekompagnie did make some parade stuff if higher foreign people visit the royal family. a born Romanowa i think these guys would fit. Olga did a lot of good things to the state of Württemberg. - Today there`s still a Olga hospital (the citizen of Stuttgart say Olgäle), an Olgastreet , a very tasty Olga Bretzel, an old Russian church in Stuttgart and Württemberg has the Grenadierregiment "Königin Olga" 119. The people say, the last king of Württemberg - Wilhelm II. was very unhappy to fight against Russia in WW1. I think your guy could be "Berckhemer". In the 1913 book he`s listed as Kriegsgerichtssekretär at the 2nd Division at Ulm. -s.V.M. - DA1 - R.A.M. Normally 1870 war commemorative medal and Centenialmedals are not listed in most books. He fought in 1870 - so he must be born around 1850 (not earlier because no 1866 medal) - in 1913 he was 63 years old. Sekretär would also fit - it´s a lower officials rank. Many thanks for your expertise!!! Is any additional info regarding Berckhemer known from the book you cited or any other source? E.g. his full name? s.V.M. - DA1 - R.A.M. Could you please let me know what Württemberg decorations these abbreviations actually stand for? s.V.M. = Silberne Verdienstmedaille. Militärverdienstmedaille oder Zivilverdienstmedaille? R.A.M. = ??? Russische [Orden der Heiligen] Anna Medaille? Only imperial Russian award has been moved a step down. However, your medal bar shows KDM-1870 für Nichtkämpfer while "my" vet sports KDM-1870 für Kämpfer. Eugen Berckhemer was born in 1866 and did not enter military service until 1884. Presumably not the guy we are looking for. Many thanks for correction, Glenn! Any ideas whose portrait do we have here then?